Ka‘ākaukukui, Kukuluāe‘o and Kewalo were once the ‘ili (sub-sections of ahupuaʻa) that is now generally referred to as “Kakaʻako,” whose shoreline portions became Kakaʻako Makai. Until fairly recently, Kaka‘ako and the surrounding area were sometimes referred to as something of a wasteland, or empty space, between the better-known locations of Kou (stretching from Nuʻuanu to Alakea Streets and from Hotel Street to the sea and now referred to as Honolulu) and Waikīkī. Kaka‘ako and surrounding lands remained outside these two intensely populated and cultivated areas on southeastern O‘ahu, yet Hawaiians used Kakaʻako’s lowland marshes, wetlands, salt pans and coral reef flats for salt making and farming of fishponds along with some limited wetland taro agriculture, and this supported habitation sites clustered around the mauka (inland) boundary of the Kaka‘ako area near Queen and King Streets. The land could probably not be used for agriculture as it was impregnated with salt. The abundance of salt led to the Kaka‘ako Salt Works in the late-nineteenth century. Mo‘olelo point to the coastal marshes as the habitat of the original pueo (owl) that became one of the Hawaiians’ ‘aumākua (deified ancestors.) The mo‘olelo of Kawaiaha‘o follows a trail between Waikīkī and Honolulu to locate two freshwater springs – Kewalo Spring and Kawaiaha‘o (The Waters of Ha‘o,) which highlights its location between the two main population centers. Kekahuna notes, Kaʻākaukukui was “a beautiful sand beach that formerly extended along Ala Moana Park to Kewalo Basin, a quarter mile long reef extended along the shore.” Kaʻākaukukui means “the right (or north) light,” and it may have previously been a maritime navigation landmark. Kukuluāe‘o, translates literally as the “Hawaiian stilt (bird)” and means “to walk on stilts.” This helps describe the area as “formerly fronting Kewalo Basin” and “containing marshes, salt ponds and small fishponds,” an environment well suited for this type of bird. The Kaka‘ako area continued to remain outside Waikīkī and Honolulu during the post-Contact era. It served as a place of the dying and the dead, of isolation and quarantine, of trash and wastelands, and the poor and the immigrant; however, it also represents the birth of modern Waikīkī and Honolulu. Specifically in this area: victims of the 1853 smallpox epidemic were quarantined in a camp and those that did not survive were buried at Honuakaha Cemetery; Hansen’s Disease patients were treated in the Kaka‘ako Leper Branch Hospital; victims of the 1895 cholera epidemic were treated at the Kaka‘ako Hospital; infected patients of the 1899 bubonic plague were moved to a quarantine camp; animals were quarantined in a station in 1905; and the city’s garbage was burned in an incinerator adjoining Kewalo. The Kaka‘ako area has been heavily modified over the last 150 years due to historic filling of the area for land reclamation and to accommodate the expanding urbanization of Honolulu. A number of land reclamation projects dredged offshore areas to deepen and create boat harbors, and used the dredged material to fill in the former swampy land. The original foot path at the edge of the former coastline has been transformed through time to a horse path, then buggy and cart path, and finally to the widened Ala Moana Boulevard. After the annexation of the Hawaiian Islands by the United States in 1898, the US Congress began to plan for the coastal defenses of their new islands, which included Fort Armstrong on the Ka‘ākaukukui Reef as a station for the storage of underwater mines. 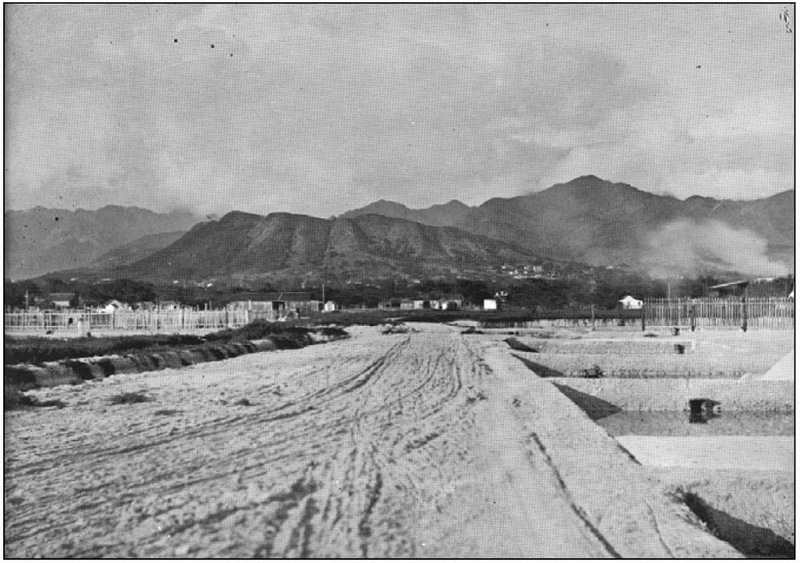 In 1911, the Honolulu Rifle Association, and possibly other groups, used the flat, uninhabited Kaka‘ako land and wetlands near the coast as a rifle range. 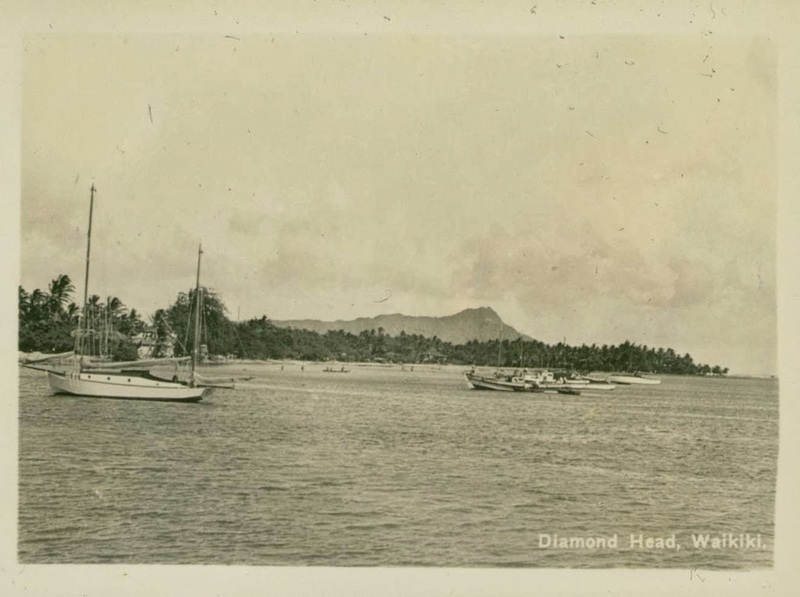 Dredging of the Kewalo Channel began in 1924, but by the time the concrete wharf was completed in 1926, the lumber import business had faded, so the harbor was used mainly by commercial fishermen. In 1941, the government dredged and expanded the basin to its current 22 acres. 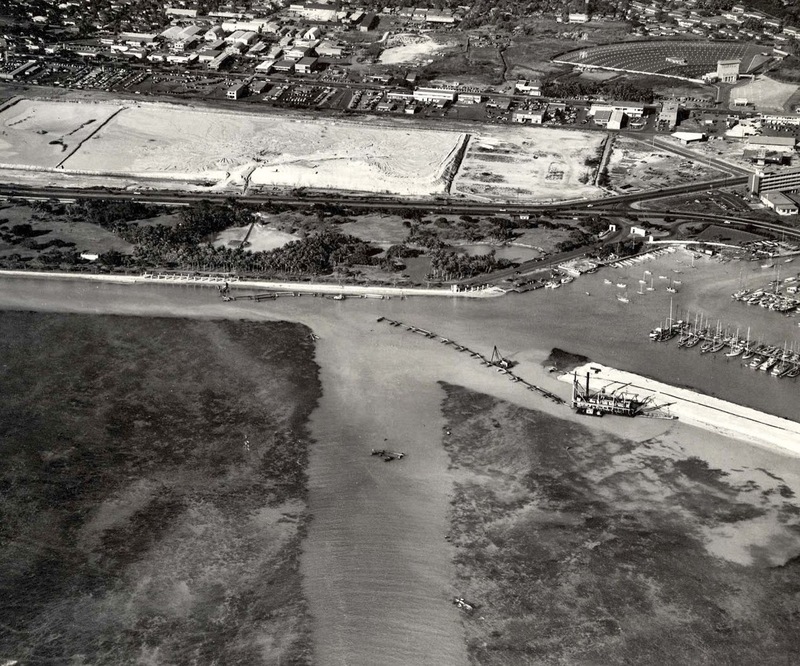 In 1955, workers placed the dredged material along the makai (seaward) side to form an eight-acre land section protected by a revetment – now the Kewalo Basin Park. As late as 1940, Kaka‘ako’s population numbered more than 5,000-residents. But after World War II, community buildings, wood-frame camp houses, language schools, temples and churches were removed to make way for auto-body repair shops, warehouses and other small industrial businesses. 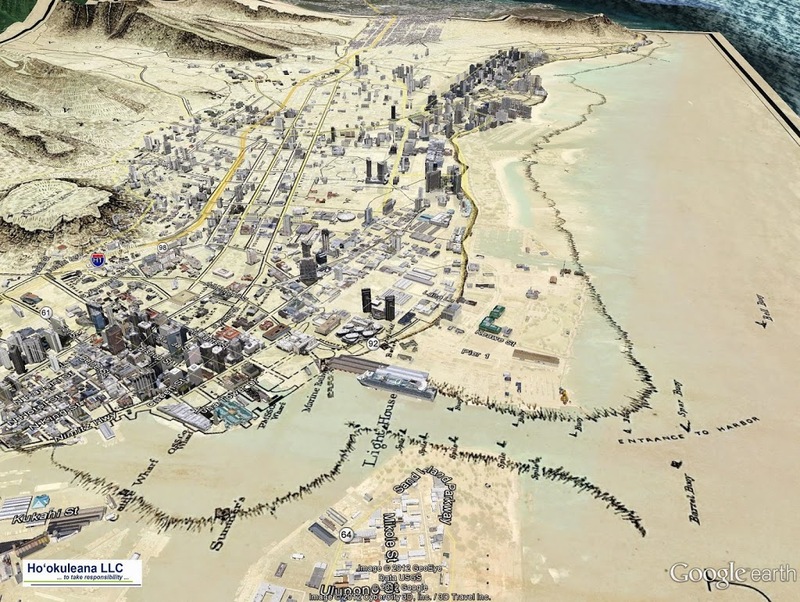 The image shows Kakaʻako, Downtown and vicinity with an 1887 Map over a present Google Earth image (with 3D buildings.) In addition, I have added other images and maps of this area in a folder of like name in the Photos section on my Facebook page. Needing supplies in their journey, the traders soon realized they could economically barter for provisions in Hawai‘i; for instance any type of iron, a common nail, chisel or knife could fetch far more fresh fruit meat and water than a large sum of money would in other ports. Foreign vessels had long recognized the ability of the Hawaiian Islands to provision their ships with food (meat and vegetables,) water, salt and firewood. Salt was Hawaiʻi’s first export, carried by some of the early ships in the fur trade back to the Pacific Northwest for curing furs. Another early market was provided by the Russian settlements in Alaska. But salt in Hawaiʻi was not just for export. Later, in the early-1820s, the Russians could get most provisions cheaper from Boston or New York than from the Hawaiian Islands, but the salt trade between the North Pacific and Hawaiʻi continued. Another trading concern was the Hudson’s Bay Company (HBC,) a fur trading company that started in Canada in 1670; its first century of operation found HBC firmly focused in a few forts and posts around the shores of James and Hudson Bays, Central Canada. Back then, salmon was a one of the most valuable commercial fisheries in the world (behind the oyster and herring fisheries.) (Cobb) Just as salt was used for curing furs, HBC used Hawaiian salt in preserving salmon. In 1898, the US Army built a seawall and filled a submerged coral reef on the ‘Ewa (western) side of Kaʻākaukukui for a gun emplacement at Fort Armstrong to protect the mouth of adjoining Honolulu Harbor. At the turn of the century, Ala Moana Boulevard was built at what was then the shoreline, and the broad areas on both sides of the future Kapiʻolani Boulevard consisted of rice fields. The dredging of harbors, offshore areas and the Ala Wai Canal provided fill for the reclamation of the ‘swamps.’ The construction of the Ala Wai stopped the annual flooding of Waikīkī. 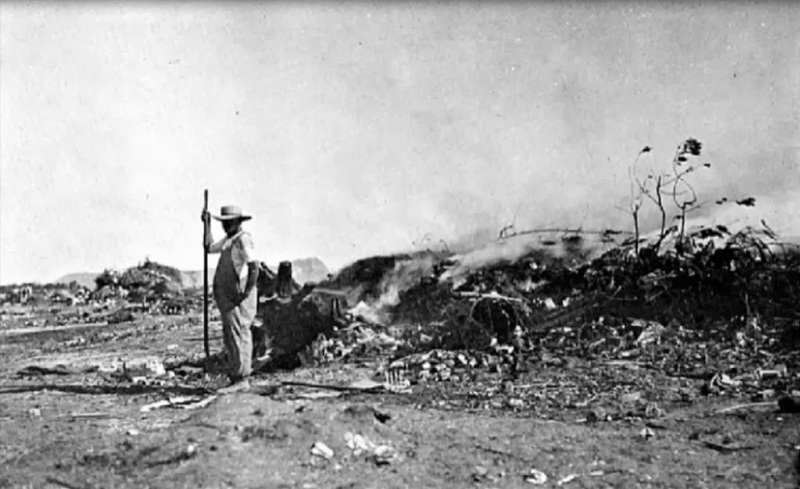 At the beginning of the twentieth-century, the stretch of coast makai of Ala Moana Boulevard between Fort Armstrong (Piers 1 & 2 at Honolulu Harbor) and Waikīkī was the site of the Honolulu garbage dump, which burned almost continually. The residue from burned rubbish was also used to reclaim wetlands. This residue provided a fill that was quite inert and solid. Thus, a rubbish dump was considered a cost-free method for a landowner to reclaim swampy land. Since at least the 1850s, the Hawaiian Monarchy was providing urban public services in Honolulu, including refuse collection and disposal. Horse-drawn wagons were first used for the collection of refuse; the horses were stabled in Kakaʻako. Following Annexation and Territorial status (1900,) garbage removal was one of six items listed in the Oʻahu County’s 1905 monthly operating expenses, along with the police and fire departments, the electric light plant, city parks and the Royal Hawaiian Band. The only direct income for Oʻahu County was its refuse collection fees. Oʻahu, like many other coastal communities, was ringed with tidelands. The area was traditionally noted for its fishponds and salt pans, and for the marsh lands where pili grass and other plants could be collected. About one-third of the coastal plain at Kakaʻako was a wetland. The entire shoreline was coral rubble bordered by fringing reefs and mudflats. As time went on, when the fishponds were no longer used, they were more often than not filled with material dredged from the ocean or hauled from nearby areas, garbage and general material from other sources. These reclaimed areas provided valuable new land near the heart of growing urban Honolulu. The ʻili of Kaʻākaukukui was awarded by land court to Victoria Kamāmalu; Princess Bernice Pauahi Bishop inherited the land, which later became part of the Kamehameha Schools (formerly the Bishop Estate). The Territory of Hawai‘i acquired the land in 1919. Just as the Army had done at Fort Armstrong, the government built a new seawall, extending east to reclaim more Kaʻākaukukui reef and submerged land. During the 1920s, the channel and basin on the Waikīkī (eastern) side of the growing Kakaʻako peninsula was dredged as a small boat harbor, called Kewalo Basin, to relieve overcrowding at Honolulu Harbor by the sampan (tuna fishing) fleet. Hawaiian Dredging Company completed Kewalo Basin’s wharf and channel in 1925, and by 1930 the sampan fishing fleet was relocated to their new base. In 1930, a garbage incinerator was constructed on Mohala Street (now ʻĀhui Street) near the east end of the Kakaʻako seawall (near Kewalo Basin.) This moved the open dump fires into a more controlled and contained facility. Incinerator Number One was later removed from service after the new incinerator on ʻOhe Street was constructed in 1946-48. With the completion of the seawall in 1949, filling operations began and by the mid-1950s the shallow reef of Ka’ākaukukui was completely covered over. And, again, in 1950 another seawall was extended and ash filled areas making more usable acreage. Following statehood in 1959, government officials met to discuss the near-completion of the fill behind the seawall. As the height increased, the State expressed concern over the mountain of ash which was growing so rapidly. The State finally told the City in 1971 to stop placing any more ash to the pile. Parts of the ash pile were then 25 feet above the top of the seawall. The image shows the open dump fires from the Kakaʻako – Ala Moana shoreline (pre-1934;) in addition, I have added other images in a folder of like name in the Photos section.